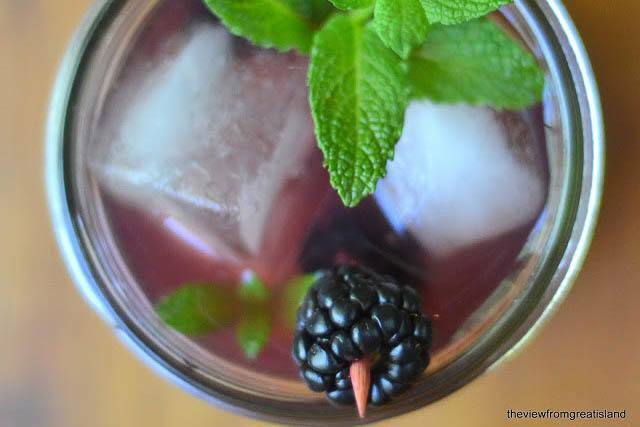 Blackberry Mojito ~ this is basically a classic mojito cocktail, with the addition of some fresh blackberry puree ~ perfect for Cinco de Mayo! To make the blackberry puree, take a handful of berries per drink, and puree them in a blender or small food processor. Add a little water to thin the puree and then strain out the seeds. Muddle, or crush, the mint leaves in the bottom of a cocktail shaker. Add ice, the rum, blackberry puree, and lime juice. Shake and pour over fresh ice. Top with club soda. Use a sprig of mint and lime for garnish. Drop in a couple of fresh blackberries if you like.